Find Tours, sightseeing tours, activities & things to do in Jerusalem. Find discounted tickets, events, and many more. Replenish the body and rejuvenate the mind, with this Dead Sea Spa and Wellness trip from Jerusalem! Cover yourself in the therapeutic natural mud, and float in the salt-rich sea amid spectacular landscape, flanked by the rolling hills of Jerusalem to the east and the mountains to the west. Book now for an affordable and easy transfer to Tel Aviv Ben Gurion International Airport. Don't waste time on trying to get back to Ben Gurion Airport, book now to enjoy the piece of mind of a pre-paid Tel Aviv Ben Gurion Airport Private Departure Transfer. Visit the Holy Land sites of Nazareth and the Sea of Galilee on a day trip from Jerusalem. You'll journey across Israel's coastal plains to explore the city of Nazareth, the setting of many New Testament tales, then travel to the Sea of Galilee, where Jesus performed many miracles. If you're intrigued by the sacred, or simply interested in the fascinating fables of the bible, this tour should be on your must-do list! 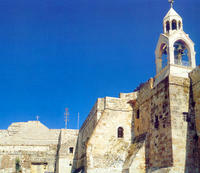 Take a half day tour from Jerusalem to Bethlehem, and discover the town famed as the birthplace of Jesus. Tracing the events of the Nativity, this comprehensive tour uncovers the highlights of this holy city for worshipers of all religions!